Middle cerebral-artery infarction from a calcific embolic material, following aortic valve surgery. 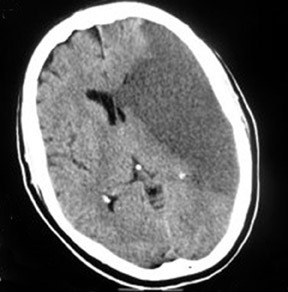 Computed tomography (CT) brain scans (pre- and postcontrast) showed a large calcific density in the proximal horizontal branch (M1) of the left-middle cerebral artery (MCA) with a large well-defined low-attenuation area in the left MCA vascular territory, accompanied by a small degree of midline shift to the right and distortion of the left lateral ventricle (Figures 1 and 2). This was consistent with an MCA infarct due to calcific embolism to the proximal M1 segment. The patient’s neurological condition rapidly deteriorated, and on the next day she was in a coma and died one day later. An autopsy was not performed. Twenty percent of patients with prosthetic heart valves will present with a cardioembolic stroke within 15 years of valve replacement,6 however, early stroke following aortic valve replacement, as in our case, is rare. Our case report therefore illustrates the utility of CT in detecting calcific cerebral embolism following aortic valve replacement. Though this type of stroke often occurs in closely monitored hospitalized patients, facilitating rapid diagnosis, management is difficult. The utility of CT in this clinical setting would therefore be even more evident allowing rapid treatment and potentially improving prognosis. Our case report illustrates the utility of CT in detecting calcific cerebral embolism following aortic-valve replacement. With future developments in intra-arterial thrombectomy, rapid diagnosis and treatment of this rare entity could improve the final prognosis ofaffected patients. Otto CM, Lind BK, Kitzman DW, et al. Association of aortic-valve sclerosis with cardiovascular mortality and morbidity in the elderly. N Engl J Med. 1999;341:142–147. Eugleman D, Cohn L, Rizzo R. Incidence and predictors of transient ischemic attacks and strokes following coronary artery bypass grafting: Report and collective review. Heart Surg Forum. 1999; 2:242-245. Salka S, Almassi GH, Leitschuh ML. Spontaneous coronary artery embolus associated with calcific artery stenosis. Chest. 1994;105:1289–1290. Boon A, Lodder J, Cheriex E, Kessels F. Risk of Stroke in a cohort of 815 patients with calcification of the aortic valve with or without stenosis. Stroke. 1996;27:847-851. Gearry RB, Sharr JP, Avery SF. 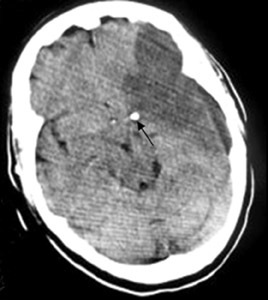 Spontaneous calcific cerebral embolus. Australas Radiol. 2005; 49:154–156. Thompson DB, Burton B, Watters M, et al. Calcific cerebral arterial embolization in the setting of bacterial endocarditis superimposed on prior rheumatic aortic valvular disease.Clin Imaging. 2003;27:304– 306. Ruel M, Masters RG, Rubens FD, et al. Late incidence and determinants of stroke after aortic and mitral valve replacement. Ann Thorac Surg. 2004; 78:77-83. Koullias G, Elefteriades J. In: Little A, ed. Complications in Cardiothoracic Surgery. Online: Blackwell, Futura; 2004:405. Gorriño O, Oleaga L, de la Fuente R, et al. Intracranial artifact in magnetic resonance caused by embolization of microscopic metallic fragment [in Spanish]. Neurologia. 2004;19:766-768. Yock DH Jr. CT demonstration of cerebral emboli. J Comput Assist Tomogr. 1981;5:190–196. Halloran JI, Bekavac I. Unsuccessful tissue plasminogen activator treatment of acute stroke caused by a calcific embolus. J Neuroimaging. 2004t;14:385-387. Molina CA, Saver JL. Extending reperfusion therapy for acute ischemic stroke emerging pharmacological, mechanical, and imaging strategies. Stroke. 2005;36:2311-2320. Calcific cardioembolic infarction following aortic-valve replacement. Appl Radiol.